Udemy launched in 2010 to help students of all ages continue their education through video-based, online courses — and in turn, give teachers (and experts) a way to make a buck by sharing their knowledge with the masses. Capitalizing on the growing interest and buzz around online learning and MOOC platforms pioneered by sites like Khan Academy, Udemy has been on a mission to create the largest online destination for on-demand, online courses. The popular MOOC platforms like Coursera, Udacity, edX and Khan Academy are all, in one way or another, on a similar mission; so, to differentiate itself, rather than offer classes for free, Udemy offers both free and paid courses, putting it more in the vein of platforms like Skillshare and Lynda.com. Since raising $12 million in December, Udemy has been looking to continue differentiating itself from the increasingly crowded market for online courses by giving students access to its catalog on the go. Today, the startup released an iOS app — its first native mobile product — in an attempt to make it easy for users to discover and take courses from their smartphones. The Udemy marketplace is growing fast, and now offers more than 6,000 courses on a range of topics from web development and business to photography, music and fitness. Udemy has added 1,000 courses since December, a big uptick from October, when it added just over 400 courses to its platform. With its new app, Udemy now allows users to browse and sign up for both free and paid courses, giving them access to video lectures, articles and presentations while on the go. The app also lets students save their courses for offline viewing to peruse during their morning commute, along with the ability to watch video lectures in multiple speeds. Courses in double-time. Udemy’s iOS apps don’t yet offer the same social elements available in its Web product (those that allow students to interact with their peers, for example), but the founders tell us that these will likely be coming in future updates. In turn, with its iOS app now live, Udemy will look to bring its online learning marketplace to Android, so look for that in the coming months. Since launching in January, the founders say, over 15,000 additional experts have committed to share courses on Udemy, including familiar names like Dan Rather, George Lucas, and Randal Kleiser. Since December, Udemy has grown from 400K registered students to over 600K, and a quarter of its approved instructors have pulled in at least $10K by offering paid instruction through Udemy — and some have even pushed into the six-figure range. Udemy takes 30 percent of those earnings, co-founder Eren Bali told us in December that, over the last nine months, the company has seen steady 20 percent month-over-month growth. Sources also tell us that Udemy has generated over $15 million in total revenue since its launch, which continues to grow. 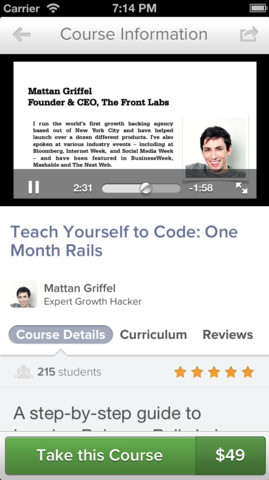 A number Udemy will look to grow as it pushes onto mobile. For more, find Udemy in the App Store here.